“If it’s not posted on Facebook, it didn’t happen” is how we often joke with friends, but when you look at the stats, that one-liner is not too far from the truth. Numbers vary, but the approximate of 1.65 billion human beings, worldwide, enjoy Facebook every single month. This makes it a most-used social media platform, from the dawn of Internet onwards. No social media site at the moment can’t even sniff Facebook’s knees, when it comes to popularity. But, the story of Facebook began rather humbly in 2004. Once a bare-bones college-students social network turned into a giant platform. A simple takeaway from Facebook’s story could be: never give up. From almost completely hidden or ghost personal profiles (made possible with Facebook’s comprehensive privacy settings) to million-followers brand pages, Facebook is an online home for literally anyone. Some people see this network as a handy, multimedial, and fast way for them to connect with their friends. Other mostly use it to chat and engage with their colleagues, and to keep the communication going inside teams. Professionals of all profiles may use it to either maintain their network or to grow their audience. Who uses Facebook the most? Depending on your business, its location and target market, these numbers can either make or break your Facebook marketing efforts, so pay close attention. According to AdWeek report, focused mainly on Western markets, the average Facebook user is 40 years old. This and similar stats point to the fact that millennials mostly turn to other social media platforms, such as Instagram or Twitter. Keep in mind though, that this data covers Western countries, while the situation in Asia is quite different. As an example, in India and Indonesia, surprising 75% of Facebook users are millennials or younger. Globally (if the entire planet is your desired market), Facebook leans towards middle-aged adults a bit more. Almost a half of its users are older than 30 years, with a slight advantage on a female side of the population (55%). Keep in mind as well that stats change, as any social platforms goes through changes all the time. Our estimates are here to give you an overall sense you could use while crafting your marketing strategy, not the final, invariable data. Despite Facebook’s popularity and the fact it has become a vital part of our (online) reality, many of its users tend to underestimate the profitable power of Pages, Groups, and Events. Each and every part of Facebook can be used in a slightly different way. Knowing the difference between them and the possibilities as well, can be game-changing for any business-focused strategy. Firstly, Facebook Profile is the beginning point and a basic place from which you can control and manage the remaining three parts, primarily your Groups, Pages and Events. But the Profile should be used only for personal activity and Pages/Groups management, while advertising from it isn’t allowed. Use your Profile as an advertising spot and Facebook will show no mercy. Now, let’s dive into each of these segments that make Facebook the powerhouse for businesses, and see how can you use them to your advantage! Luckily, there are plenty of Facebook features you can now use to grow your business. Starting from powerful ads, up to Sell Something feature in your Group, this platform is constantly making steps towards a more business-focused experience. In sections below, you’ll discover some of the methods marketing masterminds use to turn Facebook into a money-and-growth-magnet. If you’re searching for an online place where direct communication can create a powerful community, then look no further. Imagine Groups as online spaces for interaction, promotion, and notification-strengthened attention. The various levels of privacy and security enable you to craft your Group so it could perfectly fit your goals and needs. Public – where non-members can see most of the posts, but cannot interact inside the group in any way. Create Polls – best way to find out what your customers want? Ask them! Schedule the Posts (New feature) – social media platforms themselves began adding basic organizational features to simplify the posting process. Main benefits of Facebook Groups: direct communication, a sense of community, polls, Sell Something feature. If that fits into your business type and goals, consider hosting occasional Facebook Events to attract the new and further engage the existing customers. With Events, you can organize a large number of users around a one point in time. Keep in mind though, that the location doesn’t need to be physical. You can create an event around the webinar or any other kind of online or offline happening. Nice to know, right? A nicely organized, well-built Facebook event can draw many people to your brand, as well as entice interesting conversations. According to your needs, the privacy settings are customizable, ranging from public events, to completely private ones, and many variations in between. Another great element is an ability to export events to different calendars. Main benefit of Facebook Events: creating a sense of urgency with a set date, expanded visibility (when someone clicks Attending/Interested, their Facebook friends will see your event). Facebook Pages are created with the business in mind. Especially when combined with the Boost Post option, Pages can bring you directly to your target market. Therefore, Facebook has been adding new features to Pages during the past couple of years. Several changes have been made to Page’s appearance and functionality. Luckily, all these modifications are working in marketers favour. Promote Website – if you have a drool-worthy website, you can promote it directly from the About section of your Page. Play around with these features, to go beyond mere posting and explore the possibilities they hold. Facebook Pages are definitely an ultimate social media asset for a business of any size or niche. Their main benefit are boosted posts, that can reach 1000s of users on a rather small budget. Besides this, one can clearly see that Facebook’s team is devoting a lot of attention to Pages, creating a true go-to resource for growth and profit. Remember, there’s one commonly seen feature on Twitter, but not so frequently utilized on Facebook. Indeed, a pinned post can be a game-changer for your Page’s performance. Pick a high-engagement post which nicely represents your brand and pin it for everyone to see. Literally anything that presents your business in a utmost positive light! A common mistake most of the marketers/brands make with ads is boosting weak posts. Better promote well-received posts to amplify their reach and efficiency even more. Is there such a thing as a social media post that suits every channel? That would be so neat: a one form of the post that looks nice and performs well… anywhere! Unfortunately, such a structure is not possible. God knows, we tried. Every platform has its distinct rules and requirements. With almost a ⅙ of world’s population daily posting and communicating on Facebook, this overwhelmed giant needs to find ways to filter all that data. The algorithm is actually what controls and filters the News Feed. So, how can you know what kind of posts are the right fit for this social media wonderland? A one part of the story is how your posts are structured and the other part that equally impacts Facebook’s algorithm, is how you interact with your audience. First, let’s discover the secrets of most successfully shaped posts for Facebook. So, we got the main thing straight – there is no such thing as a post that fits every channel. Fortunately, a general recipe for a well-structured Facebook post can be outlined. Firstly, the intention or a main idea that will help you shape any visual or textual update is: entertaining and educational. You’ve already learned how Facebook uses an algorithm, to cut through the massive chaos, bringing only the most relevant and high-quality content to its users. Knowing this, brands and companies need to provide a constant flow of interesting original or carefully curated posts. Please note that this is not a guarantee for success (as it depends on multitude of reasons), but it does help with a stand-out-get-noticed effect. Adding value is the must, as mere selling is no longer effective. Simply, we humans have become resistant to entirely money-focused marketing. Nowadays, we seek more. We engage with brands who communicate with us, not just promote their products/services. Keep this in mind when crafting your posts. Certainly, for a young business, that does not have the substantial amount of original content yet, curated pieces come to the rescue. Curated, or content forms produced by other people/companies, may also play a critical role in how your reach and page growth. Whenever sharing curated content, make sure to add a comment of yours, to add your opinion and strengthen your brand. You can also share the posts you disagree with and explain why! This is a time of short-attention-span information. Despite the space Facebook provides to its users (you could write a total of 63.206 characters), as little as 40 characters proves to be the most effective length. When it comes to Facebook, the shorter, the better. You’ll get approximately 400 characters of space, until Facebook organizes the text with “See More”. That is more than enough for any kind of entertaining information. Thinking of your post’s length, the average of 100 characters is desirable. Until recently, you can add a simple color/colorful pattern to your statuses, so try organizing your text this way too. Some of the social media platforms, such as Twitter or Instagram, rely considerably on hashtags. Despite the fact Facebook provides this option, hashtag use is not nearly as powerful. Just the opposite, your posts will presumably receive less engagement with hashtags, than those without (according to 1-billion posts Buzzsumo’s study). Probably the use of hashtags doesn’t seem so helpful for most Facebook users. In Twitter of Instagram, we’ll gladly use those actionable symbols for search and navigation, but that doesn’t seem to be the case with Facebook. It simply doesn’t care about hashtags that much. On the contrary, using tags (or name tags) can be useful on Facebook, especially if you’re interested in connecting with influencers or other brands and companies. Once tagged, another public Facebook page (actually, its admins) will be notified about your action. Drawing the attention to your content in this way can be rewarding, especially if your plans are directed towards partnerships, guest posting, and similar. The general rule for tag use for Facebook is the one we’ll mention pretty often – don’t overdo it. It might be tempting to get as many influential people notified about your activities, but going overboard in anything can be punished by Facebook (and any other platform, to be honest). Oh, nothing better than a nicely optimized post with attention-grabbing visuals! Make sure that any visual component you choose for Facebook posting, especially photos, are high-quality, clear, and eye-catching. When choosing stock photos (if that is your source of preference), do not pick the most downloaded ones. Also, be courageous – approach the images with creativity, boldness, individuality. When it comes to social media, and Facebook in particular, visual identity is crucial. Should I post from Facebook directly? An interesting fact (also found in the mentioned BuzzSumo research) is: when images are posted via Instagram into Facebook, they’ll receive higher engagement, compared to native Facebook image posts. This data is based on a study of over 1 billion posts, from more than 3 million Facebook pages worldwide. Usually, less engagement is achieved, when posting from one platform to another. As an example, Facebook doesn’t act so friendly towards Youtube videos, but prefers native Facebook videos instead. Note that videos directly uploaded to Facebook can get over six times more engagement than embeded videos (oh yes, that is a lot). Sign up to Amplifr and connect your Facebook Pages to try our Instagram cross-posting feature. Maybe because Instagram is owned by Facebook, images posted via this platform will gain more visibility, therefore – all that lovely engagement. I don’t like images. What if I stick to image-less posts? Of course, you could completely avoid images in your posts. But honestly, we wouldn’t recommend it. Because, what is the main goal of posting, essentially? To draw attention to your offers/products/services and inspire profitable action. Surely you could do this with text only, but remember that we humans are mostly visual beings. When we like what we see, chances are higher we’ll actually interact with the content. Not to mention that merely drawing attention to your post can be challenging. Images, and other visual elements, such as gifs, charts or similar, can certainly make your brand more noticeable on Facebook. Canvas – a feature which enables you to combine photos and videos into a unique post. No spamming (also hashtags are pretty irrelevant here). How often and when should you post on Facebook? In the course of 20 minutes, an approximate of 1 million links, almost 5 million photos and over 700.000 status updates are being shared on Facebook. These astonishing numbers do seem intimidating, as they prove how getting your content seen can be a daunting task. The mere logic would suggest that you should post as frequent as possible, in order to rise above this cacophony and actually get noticed. But, the truth is entirely opposite. When you post just once or twice per day, but doing your best to provide high-quality experience to your audience, the Facebook magic happens. Your best content will filter to the top, and most importantly, Facebook’s algorithm will fall over heels for you. When situation becomes too chaotic, the Law, Order and their brother Excellence enter the room. Simply, in an overwhelm of content, Facebook had to find the way to filter which posts are News Feed worthy, and those value (and quality) criteria lie behind its algorithm. Make friends with these rules and your success on Facebook is almost guaranteed. When it comes to Facebook, no, timing is not everything. Sure, for location-focused businesses, do make sure that your posts match the usual schedules and habits of your target audience. Facebook Analytics can come handy in determining these activity peaks, but keep in mind that certain management tools, such as Amplifr, contain more in-depth data that can help you out. But, frequency does influence your marketing efforts. As mentioned, more is less in the case of Facebook. Overflowing your feed can only make this giant’s algorithm angry. And that’s exactly what we’re trying to avoid here! When posting, focus on a smaller amount of engaging, educational, and entertaining content. Additionally, step out of the shadows and interact with your audience, especially during high-peak activity times. As you might have guessed, there are no rules in love. We mean, social media marketing. With that said, do not focus all your attention to any of these examples. Your business (or your client’s business) is unique. Your perfect posting times might be completely useless to someone else, and vice versa. Experienced analysis – look at the data and don’t forget that every month is not the same (consider holidays and similar season-related elements). Try these in your audience’s local time, obviously! This is when the majority of users are checking their Facebook feed. Once more, there are no rules, so make sure you explored all the options. Desirably, arm yourself with a powerful analytic tool, to make sure you’re seeing the entire picture. No spamming. Do not spam your audience, simply do not do that. If anything you’ve posted is not truly spam, but smells spam-ish, again, avoid it. By all means, never ever spam your audience. Excuse us repeating, but please, just don’t spam. The opposite of spamming might be classy, tactful, and strategy-based outreach. Avoid sending mass-event invites, messages or invitations focused on your brand page, but coming from your private account. That kind of aggressive behaviour will not only turn potential customers from you, but it will also get you banned and directly blocked from Facebook. Simply, this platform doesn’t allow spamming of any kind. Did we mention that spamming is bad for your Facebook’s health? Firstly, what are clustered updates and why should you avoid them? Spamming doesn’t end with messages or invitations, sent to many people at the same time. It extends to the way you’re posting the updates too. The behaviour you should also avoid, if successful, long-term Facebook growth is what you seek, is clustered updates. When you post multiple updates within a rather short time span, the algorithm sees your Page/Group as simply – annoying. Therefore, the frequency of your posts throughout the 24 hours matters, but also the time distance between the posts themselves. The only exception to this rule of clustered updates is an image album. When you post several images, nicely arranged in an album, Facebook treats the update as a single point in your audience’s News Feed. And that works just fine! Thankfully, Facebook gave us the features which can significantly improve our performance on this social media platform. One of the helping hands Facebook offered us is in-platform scheduling of posts. Meaning, if you wish to make a basic scheduling setup and ensure that your posts are intelligently distributed in time, you’re free to do so without even leaving Facebook’s dashboard. You’re not here because you want basics. You already own the basics in your pocket. For more powerful scheduling options, which go hand-in-hand with insightful analytics, consider social media management tools. The best way to both manage and improve your posting technique is through using these software tools, created to bring control, clarity, and efficiency into your marketing. Sign up to Amplifr and connect your Facebook profiles and Pages to schedule posts and save up to 5 hours every week. Bonus tip: keep in mind that engagement is like candy to Facebook’s algorithm. Once your posts are scheduled to audience-friendly times, make sure to be around and give adequate responses. There is a huge shift happening as we speak. More and more marketers turn towards value-led communication in all their marketing efforts. This rising trend is most visible in social media and of course, on Facebook. What does value-focused marketing mean? Essentially, this kind of strategy is based on value – sharing, and education. The “old age” marketing principles of “our offer is great, buy it” are no longer effective. Nowadays, the course of selling turns to “this and this will make your life easier, and (delicately) this offer can help you get there”. What kind of Facebook posts perform the best. But, does this influence the way people are interacting on Facebook? It certainly does! Keeping a more value-oriented communication enhances customer experience in various ways. When a both entertaining and useful content is shared, audience will likely mention, share, and recommend it further. Think of it this way – what kind of content do you usually promote and send on? Exactly, high-quality, helpful content. Firstly, it is highly recommended to swiftly and elaborately answer to your customer’s comments, reviews and messages. Go beyond mere posting and show to your audience that you’re truly devoted to them! This is how long-term relationships are built – on trust, helpfulness, exchange. Actually, Facebook almost forces you to promptly answer the messages sent to your page. It also shows the average response time on the right side snippet in your Page. If you’re answering in less than 15 minutes, Facebook will show (off) that information. What inspires the engagement on Facebook? … And we do not mean the romantic kind. Occasionally hosting the contest or giveaway can also boost the engagement – but please note that it is not permitted to organize contests on Facebook directly, so it’s better to use platforms such as Binkd or Strutta. Reposting the content – yes or no? This question is by far one of the most trickiest when it comes to Facebook marketing. The reason behind its complicity might be the uniqueness of every business and its communication nuances. Some of the gigantic companies do recommend reposting, but again, their audiences and business are large enough to sustain experiments. Not every business, especially a starting entreprise, can play with posting in such a way. But, let’s see what are the possible pros and cons of reposting on Facebook! According to Neil Patel’s words from this Forbes article, only a fraction of your fans will see each of your posts. Knowing this, reposting at different times does make sense, making it possible for other segments of your audience to actually view your content. Finally, occasional reposting might save you from a dried-up content calendar. Keeping a five-star level in posting can be challenging after a while. If you repost the same, but exactly the same content (which is not desirable in general), Facebook will organize those post into a stack. In this way, the whole point of reposting is lost, as this kind of grouping will erase the space between them. Also, fairly consistent and largely identical posts can affect your affinity factor. This element of the algorithm filters the posts based on engagement data. The more you share the same content, the less people will interact with it. After a while, the overall visibility of your Page or Group could significantly drop. Auch. Lastly, your audience might mark those repeating posts as spam. Even bigger auch! This action could be addressed, through a rather fast process. Anyhow, it may also hurt your page as a whole. What if I repost intelligently and carefully? In the world of marketing, moderacy doesn’t always pay off. But, strategic moderacy is always a brilliant idea. Post the same (or strikingly similar) content in different, divided times, in 2 or 3 occasions, and not only you’ll stay friends with The Algorithm, but you may also experience the growth. You can also spread your reach to users in different timezones, if you take the “smart ‘n’ data-driven” approach. And finally, you can revive the weeks or months old posts, offering them to new visitors. 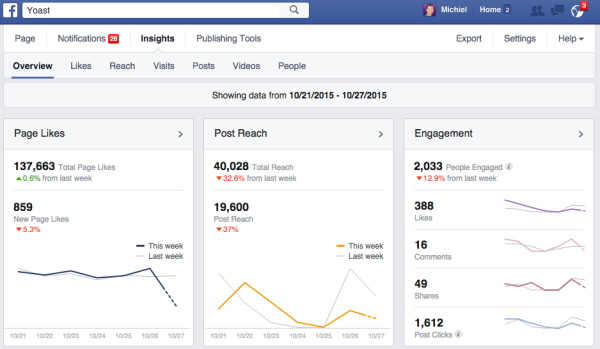 As you saw, it might be easy to create the spikes of engagement of Facebook. But, in order to keep the engagement intensity stable, even increasing, is not plain sailing. Consider hosting contests or giveaways with Binkd, Strutta or similar software. The secret of successful Facebook engagement lies in audience’s experience, not your conversion rates. Stay focused on your user’s needs, interests, and wishes. Take on a challenge to build a community, not a mere customer base, and you’ll see a significant growth as a according reward. There are many ways how an understanding of Facebook Analytics can help you structure, organize, and plan the upcoming content. Trying to grow a business with a Facebook Page, but without a deeper knowledge of its numbers and graphs, reminds us of driving without a map (or GPS). The ride might be interesting and exciting, but a destination will vary between a pleasant surprise and a complete disappointment. Now, what if your goal to better understand the way Facebook algorithm functions, but without “too-much-data” headaches? You probably yearn for actionable, practical tips, not over-complicated theory. You’re on the right place! Let us analyze the bricks and mortar of Facebook analytics. What can you do with Facebook Analytics/Insights? These integrated tools can be a powerful ally for professionals wanting to track how their Facebook Pages are performing, on a deeper level. Which type of content was popular on your Page (s). Without any doubt, knowing these numbers can significantly impact the way you perceive your Page’s performance. Data on virality of the posted content. Alright, so what can you do with this data? The main goal is to identify the high-performing, successful posts and further analyze them. Maybe you’ll discover a pattern: are they posted at similar times? Is the form of those posts the same (video, text, link or image)? Strategize the reposting of those successful posts. How to act after seeing the data? So, you should surely re-think your Facebook strategy over and over again, as the numbers will change through time. But, there are certainly numbers that cannot impact your Page’s growth in any significant way. Dwelling on these parts of Insights can take a lot of time, which can be used for more growth-inspiring actions. A perfect example of this kind of rather uninteresting data are Likes. Surely, it is nice to see an enormous number in this section, but the quantity of Likes itself can have minimum impact on growth and preferably, profit. What matters is more quality-based information. Who are your fans and is their demographic aligned with your perfect target market profile? When did the unlikes occur? Consider going back to the posts shared on those days to grade them more harshly. Use every single part of stats to create actionable takeaways and notes. No matter how detailed, the numbers themselves don’t mean much if they’re understood in a right way. As another example, a Talking About This section can also be used as a demographic tool, which can further improve on your perfect buyer personas (maybe even more than your actual Page fans!). Think about it – what does it take for you to go beyond liking and commenting, and actually discuss a certain content on social media? That’s right, you must really like that content and its message. Sign up to Amplifr and connect your Facebook profiles and Pages to receive full reports on their performance. See people from Talking About This as your company’s ambassadors and find ways to craft your offer, so they’ll like it even more. We know very well how data, numbers and stats can seem boring, even intimidating. But please, do not underestimate the pragmatic potential this information contains. For instance, can you truly grasp your Page’s performance, without looking into sections like Total Daily Reach? The short answer is – no. The deeper you go into stats, the more clarity you’re going to gain about your Facebook (and overall) marketing strategy. And when you finally become addicted to that functional, success-ensuring information, consider implementing more powerful analytic tools, such as ones you’ll find in Amplifr. Usually, cross posting between two social media platforms is not really recommended. Oddly enough, that is not the case with Facebook and Instagram. Maybe the secret behind this algorithmic partnership lies in the fact that Instagram is actually owned by Facebook (and maybe it doesn’t). Whatever the case, posting images to Facebook from Instagram is definitely a smart idea. Instead of the direct upload, the Instagram-Facebook connection can considerably improve both the visibility and engagement of those images. Hurray! Besides the increased engagement (which is extremely nice and surely desirable), there are many other benefits to using this peculiar cross-platform uploading. You will showcase relevant images to your audience, strengthened with relevant hashtags. When an opportunity appears to cross-promote your content on different platforms, embrace it. Especially in cases like this, where that kind of behavior is even rewarded! As a marketing platform, Instagram is offering a great deal of merit. When combined with all Facebook’s possibilities, Instagram’s impact increases. Why would anyone miss on that? We don’t know either. Often, a such a rewarding activity sounds like a lot of work. But, this is not the case with Instagram and Facebook. These giants truly go hand in hand. As an example, Twitter would publish your Instagram post in a form of the basic web link. But Facebook lets you share the images directly from Instagram, right into the Timeline/News Feed. Such a wonderful partnership, right? Use hashtags on Instagram to connect with relevant users and inspire them to follow you on Facebook too (as you know, Facebook is not a hashtag-loving place). As you probably realized along the way, Facebook marketing is truly a complex field, with many unexpected twists and turns. Nevertheless, Facebook is definitely worth the effort, and I encourage you to further explore its possibilities. Magnificent are the ways in which this platform, when used properly, can impact your business. Use it to both share your voice with the world, make an impact, and finally, bring in more customers and users into your business! And of course, never stop learning – knowing more about marketing always, always pays off. Facebook Pages are a no. 1 money-making asset of this platform (and probably, social media in general). And images posted from Instagram gain more engagement than the ones posted directly from Facebook. Embrace the power of scheduling. Try building a strong community around your brand. “Talking About This” data shows what kind of updates did your brand’s ambassadors like (and try producing more of such posts). You can also advertise your contests from Facebook on Instagram, to draw more relevant traffic and gain even better results! A guide for international companies.